Tickets no longer available online. Please purcahse tickets at door of Christ Cathedral. 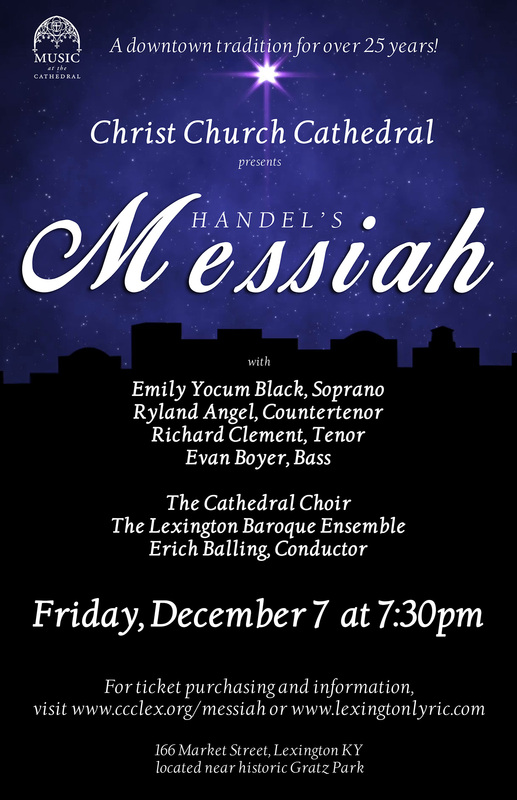 Tickets are now on sale for the annual performance of Handel’s masterpiece Messiah. Presented in the beauty of the Cathedral, this is the essential Christmas music experience. The Lexington Baroque Ensemble, guest soloists and the Cathedral’s boy, girl and men’s choirs join forces under the direction of Canon Musician Erich Balling. Christ Church Cathedral offered the first Lexington performance of this work. Today, it is considered by many to be the premier performance of its kind in the city. Tickets are $40, $30, or $20 and can be purchased online at the link below, by calling 859-280-2218, or in person at the Lyric Theater box office located at 300 East Third Street. We are proud to have the Lyric Box Office partnering with us to provide ticket sales this year. *On Friday December 7 at 5:00 p.m. online ticket sales for this event will be closed. If you are still in need of purchasing tickets for the event the Lyric Box Office will be at Christ Church Cathedral at 6:00 p.m.